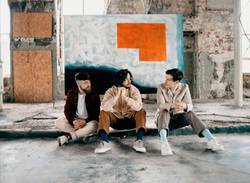 Fatherson's new album seesaws between visceral, enveloping rock music and experimental, cinematic soundscapes, which should come as no surprise as the Scottish trio's back catalogue has always shown the musical creativity of a band who refuse to be pigeon-holed. Sum of All Your Parts, the band's third album, is an engrossing listen from start to finish. The album was written in the band's hometown of Glasgow over several months, before the trio decamped to a disused chair factory, since converted into a studio, to record the album. The result is a record that bristles with an irrepressible intensity created by Ross Leighton's emotive and relatable lyrics and vocals alongside his hook-laden guitar playing, coupled with Marc Strain's melodic bass playing and Greg Walkinshaw's fervent drumming. "We recorded the majority of Sum of All Your Parts in a place called the Chairworks in Castleford," explains Ross, "which is just outside Leeds in England. We spent three weeks there and a week in our little studio in Glasgow, but it was amazing to write the album in Glasgow. It was amazing to have nine months of no touring and a studio to go to everyday. We’ve never had that before, and that was the biggest blessing. It was also amazing to have somewhere where we could incubate our stuff, where we’d go back to the studio and it would feel quite homely. "[The place where we were writing] was this massive building. We had the guitars, drums and the amplifiers at one end of the building, and we were micing up at the end of the hall. We had to get some big drum noises and some wee drum noises, so we ran amps in every single room at one point, which would be like ten amps going with one guitar being played through them. We had an absolute blast. "We were in an old telecoms building in Glasgow with this really big hallway, and we spent nine months in there, nine-to-five, playing music, and we ended up finishing some stuff from the album in the hallway. So any weird snare drums and stuff like that on the album, they were all done down a flight of stairs, on a metal staircase, in Glasgow." The band experimented with their sound and looked at the direction they wanted the album to take while in the process of writing the record, before whittling down which songs would make the cut for the album. "I think, sometimes, you get lost in the minutiae of everything and it can make the songs a little bit like, ‘Does that really have to be there?’ There were so many shite songs, where you’d spend so much time going, ‘Do you want the album to go this direction or that direction?’ So we went down the rabbit hole a few times, doing sort of weird music. The last song on the album, we just claw back the lighter side of that rabbit hole." When the time came to record the album, the band enlisted the help of Claudius Mittendorfer, a skilled producer and engineer who's worked with bands including Muse, Interpol, and Franz Ferdinand. By this point, the band had been diligently going to the studio every day for months and spent very little time apart, but Claudius immediately became part of the fold. “We made an album in a way that I’d never experienced - with no stress or pressure." "At the point when Claudius came over to Glasgow, Marc, Greg and I had been without each other’s company for about...ten or eleven days was the longest we’d not been with each other. We were like a singular entity. This guy had to come and join into that, but it felt like he’d been there the whole time," says Ross. "Words can’t express how amazing it was to meet that guy and work with him – we all made a friend for life. He was fantastic, and I think we felt so blessed that he wanted to work with us. And when we actually worked together, we just hung out and had fun for a month. We made an album in a way that I’d never experienced - with no stress or pressure." When the band stepped into the studio with Claudius, they already had a firm blueprint for the album in the form of a complete tracklist which they then recorded in order. The album soars on high points like the infectiously catchy "Making Waves" and the alt-rock haze of "Charm School", and dips into quieter but no less affecting moments, like on the sweet, lilting "Nothing to No One", which features vocals from Sarah Howells, AKA Bryde, and the powerful closer "Building a Wall". 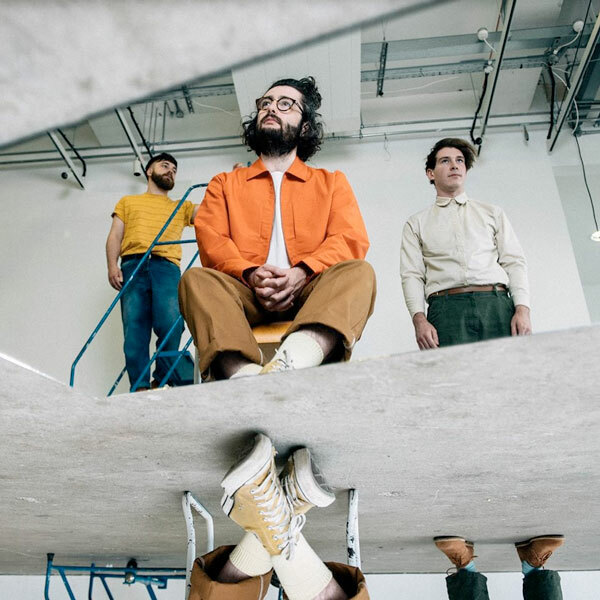 The songs also capture a variety of subtle sounds, which came to be on the album as a result of Fatherson's propensity for collecting sounds that surround them, and incorporating them into their songs in interesting ways. "The opening song, "The Rain", has got a little thing that starts with it, like a clock winding up, and that was the sound of the heater that was in my room in the studio. The studio was in an old chair factory, and the rooms were freezing, so you had to have an electric heater in the room. On "Ghost", there’s a broken fire alarm that we had in Glasgow when we were writing the album. There’s just loads of field recordings from things that we were doing that year, and that’s mixed into the album." Sum of All Your Parts is a triumphant return for the band after 2016's well-received Open Book, and it's clear that the album has even further cemented the close bond between the trio, who started playing music together when they were teenagers. Reflecting on what impact he hopes the album will have, Ross is optimistic and hopeful. "We’re on our third album, and to loads of people we’re still a new band, which is great. I think that if this is their introduction to this band then it’s going to give them a pretty well-rounded view of what we’re all about. I just hope that people like it and we get to play shows for the next five years. We just want to make sure that we’re in a position where we’re in a band and can travel to new places and play for new audiences, and see where it takes us." Words by Aideen on Oct. 21, 2018, 2:54 p.m.
Posted by Aideen on Oct. 21, 2018, 2:54 p.m.